For the Clannad song, see Newgrange (song). Newgrange (Irish: Sí an Bhrú or Brú na Bóinne) is a prehistoricmonument in County Meath, Ireland, located 8 kilometres (5.0 mi) west of Drogheda on the north side of the River Boyne. It was built during the Neolithic period, around 3200 BC, making it older than Stonehenge and the Egyptian pyramids. The site consists of a large circular mound with an inner stone passageway and chambers. Human bones and possible grave goods or votive offerings were found in these chambers. The mound has a retaining wall at the front, made mostly of white quartz cobblestones, and is ringed by engraved kerbstones. Many of the larger stones of Newgrange are covered in megalithic art. The mound is also ringed by a stone circle. Some of the material that makes up the monument came from as far away as the Mournes and Wicklow Mountains. There is no agreement about what the site was used for, but it is believed that it had religious significance. Its entrance is aligned with the rising sun on the winter solstice, when sunlight shines through a 'roofbox' and floods the inner chamber. Several other passage tombs in Ireland are aligned with solstices and equinoxes, and Cairn G at Carrowkeel has a similar 'roofbox'. Newgrange also shares many similarities with other Neolithic constructions in Western Europe, such as Maeshowe in Orkney, Scotland and Bryn Celli Ddu in Wales. It is the most famous monument within the Neolithic Brú na Bóinne complex, alongside the similar passage tomb mounds of Knowth and Dowth, and as such is a part of the Brú na Bóinne UNESCOWorld Heritage Site. Newgrange consists of approximately 200,000 tonnes of rock and other materials. It is 85 metres (279 ft) wide at its widest point. The Newgrange monument primarily consists of a large mound, built of alternating layers of earth and stones, with grass growing on top and a reconstructed facade of flattish white quartz stones studded at intervals with large rounded cobbles covering part of the circumference. The mound is 76 metres (249 ft) across and 12 metres (39 ft) high, and covers 4,500 square metres (1.1 acres) of ground. Within the mound is a chambered passage, which can be accessed by an entrance on the southeastern side of the monument. The passage stretches for 19 metres (60 ft), or about a third of the way into the centre of the structure. At the end of the passage are three small chambers off a larger central chamber, with a high corbelled vault roof. Each of the smaller chambers has a large flat "basin stone", which was where the bones of the dead were possibly originally deposited, although whether it was actually a burial site remains unclear. The walls of this passage are made up of large stone slabs, twenty-two of which are on the west side and twenty-one on the east, which average out at 1½ metres in height; several are decorated with carvings (as well as graffiti from the period after the rediscovery). The ceiling shows no evidence of smoke. Newgrange contains various examples of abstract Neolithic rock art carved onto it which provide decoration. These carvings fit into ten categories, five of which are curvilinear (circles, spirals, arcs, serpentiniforms and dot-in-circles) and the other five of which are rectilinear (chevrons, lozenges, radials, parallel lines and offsets). They are also marked by wide differences in style, the skill-level that would have been needed to produce them, and on how deeply carved they are. One of the most notable examples of art at Newgrange are the triskele-like features found on the entrance stone. It is approximately three metres long and 1.2 metres high (10 ft long and 4 ft high), and about five tonnes in weight. It has been described as "one of the most famous stones in the entire repertory of megalithic art." Archaeologists believe that most of the carvings were produced prior to the stones being erected, although the entrance stone was instead carved in situ before the kerbstones were placed alongside it. Frank Mitchell suggested that the monument could have been built within a space of five years, basing his estimation upon the likely number of local inhabitants during the Neolithic and the amount of time they could have devoted to building it rather than farming. This estimate was, however, criticised by Michael. J. O'Kelly and his archaeological team, who believed that it would have taken a minimum of thirty years to build. During much of the Neolithic period, the Newgrange area continued to be a focus of some ceremonial activity. In the Late Neolithic, it appears that Newgrange itself was no longer being used by the local population, who did not leave any artefacts in the passage tomb or bury their dead there. As the archaeologist Michael J. O'Kelly stated, "by 2000 [BC] Newgrange was in decay and squatters were living around its collapsing edge". These people were adherents of the Beaker culture, which had been imported from mainland Europe, and made Beaker-style pottery locally. A large timber circle (or henge) was built to the south-east of the main mound and a smaller timber circle to the west. The eastern timber circle consisted of five concentric rows of pits. The outer row contained wooden posts. The next row of pits had clay linings and was used to burn animal remains. The three inner rows of pits were dug to accept the animal remains. Within the circle were post and stake holes associated with Beaker pottery and flint flakes. The western timber circle consisted of two concentric rows of parallel postholes and pits defining a circle 20 metres (66 ft) in diameter. A concentric mound of clay was constructed around the southern and western sides of the mound which covered a structure consisting of two parallel lines of post and ditches that had been partly burnt. A free-standing circle of large stones was raised around the Newgrange mound. Near the entrance, seventeen hearths were used to set fires. These structures at Newgrange are generally contemporary with a number of henges known from the Boyne Valley, at Newgrange Site A, Newgrange Site O, Dowth Henge and Monknewtown Henge. However, studies in other fields of expertise offer alternative interpretations of the possible functions, which principally centre on the astronomy, engineering, geometry and mythology associated with the Boyne monuments. It is speculated that the sun formed an important part of the religious beliefs of the Neolithic people who built it. One idea was that the room was designed for a ritualistic capturing of the sun on the shortest day of the year, the Winter Solstice, as the room gets flooded with sunlight, which might have helped the days start to get longer again. This view is strengthened by the discovery of alignments in Knowth, Dowth and the Lough Crew Cairns leading to the interpretation of these monuments as calendrical or astronomical devices. Formerly the Newgrange mound was encircled by an outer ring of immense standing stones, of which twelve of a possible thirty-seven remain. However, evidence from carbon dating suggests that the stone circle which encircled Newgrange may not be contemporary with the monument itself but was placed there some 1,000 years later in the Bronze Age. This view is disputed and relates to a carbon date from a standing stone setting which intersects with a later timber post circle, the theory being that the stone in question could have been moved and re-set in its original position at a later date. This does, however, show a continuity of use of Newgrange of over a thousand years; with partial remains found from only five individuals, the tomb theory is called into question. Once a year, at the Winter Solstice, the rising sun shines directly along the long passage, illuminating the inner chamber and revealing the carvings inside, notably the triple spiral on the front wall of the chamber. This illumination lasts for about 17 minutes. Michael J. O'Kelly was the first person in modern times to observe this event on 21 December 1967. The sunlight enters the passage through a specially contrived opening, known as a roofbox, directly above the main entrance. Although solar alignments are not uncommon among passage graves, Newgrange is one of few to contain the additional roofbox feature. (Cairn G at Carrowkeel Megalithic Cemetery is another, and it has been suggested that one can be found at Bryn Celli Ddu.) The alignment is such that although the roofbox is above the passage entrance, the light hits the floor of the inner chamber. Today the first light enters about four minutes after sunrise, but calculations based on the precession of the Earth show that 5,000 years ago first light would have entered exactly at sunrise. The solar alignment at Newgrange is very precise compared to similar phenomena at other passage graves such as Dowth or Maes Howe in the Orkney Islands, off the coast of Scotland. During the medieval period, Newgrange and the wider Brú na Bóinne Neolithic complex gained various attributes in local folklore, which was often connected to figures from wider Irish mythology. The monuments of the Brú were thought of by some as being the abode of the supernatural Tuatha De Danann, whilst others considered them to be the burial mounds of the ancient kings of Tara. Amongst those who believed the folkloric tales relating the Brú to the Tuatha De Danann, it was commonly thought that they were the abode of the most powerful of the Tuatha, particularly The Dagda, his wife Boann and his son, Oengus. According to the 11th-century Book of Lecan, the Dagda had built the Brú for himself and his three sons, whilst the 12th-century Book of Leinster describes how Oengus tricked his father into giving him the Brú for all eternity. Another text, The Pursuit of Diarmaid and Grainne also implies that Oengus owned the Brú, when he declared how he took his friend Diarmaid to it. These antiquarians often concocted their own theories about the origins of Newgrange, many of which have since been proved incorrect. Thomas Pownall conducted a very detailed survey of New Grange in 1769 which numbers all the stones and also records some of the carvings on the stone but also stated that the mound had originally been taller and a lot of the stone on top of it had subsequently been removed, a theory which has subsequently been disproven by archaeological research. The majority of these antiquarians also refused to believe that it was ancient peoples native to Ireland who built the monument, with many believing that it had been built in the early medieval period by invading Vikings, whilst others speculated that it had been actually built by the ancient Egyptians, ancient Indians or the Phoenicians. Following the O'Kelly excavation, further restoration and reconstruction took place at the site. Based on the positions of the cobblestones, and after conducting experiments, O'Kelly concluded that they had made up a retaining wall but had fallen from the face of the mound. As part of the restoration, this wall was 'rebuilt' and the cobblestones were fixed into a near-vertical steel-reinforced concrete wall surrounding the front of the mound. This work is controversial among the archaeological community. P. R. Griot described the monument as looking like a "cream cheese cake with dried currants distributed about. "Neil Oliver described the reconstruction as "a bit brutal, a bit overdone, kind of like Stalin does the Stone Age". Critics of the new wall point out that the technology did not exist when the mound was created to fix a retaining wall at this angle. Another theory is that some, or all, of the white quartz cobblestones had actually formed a plaza on the ground at the entrance. This theory was preferred at nearby Knowth, where the restorers laid the quartz stones out as an "apron" in front of the entrance to the great mound. Newgrange is located 8.4 kilometres (5.2 mi) west of Drogheda in County Meath. The interpretive centre is located on the south bank of the river and Newgrange itself is located on the north side of the river. Access is strictly via the interpretive centre only. Access to Newgrange is by guided tour only. Tours begin at the Brú na Bóinne Visitor Centre from which visitors are taken to the site in groups. Current-day visitors to Newgrange are treated to a guided tour and an re-enactment of the Winter Solstice experience through the use of high-powered electric lights situated within the tomb. The finale of a Newgrange tour results in every visitor standing inside the tomb where the tour guide then turns off the lights, and lights the light bulb simulating the sun as it would appear on the winter solstice. To experience the phenomenon on the morning of the Winter Solstice itself from inside Newgrange, visitors to Bru Na Bóinne Visitor Centre must enter an annual lottery at the centre. Of the thousands who enter, twenty are chosen each year. The winner is permitted to bring a single guest. The winners are split into groups of ten and taken in on the five days around the solstice in December when sunlight can enter the chamber, weather permitting. ^ "Sí an Bhrú /Newgrange". logainm.ie. Retrieved 27 April 2015. ^Day and Night endnotes. Being in Time. ^O'Kelly, Michael J. 1982. Newgrange: Archaeology, Art and Legend. London: Thames and Hudson. Page 13. ^Carrowkeel Cairn G. The Megalithic Portal. ^ ab "The Winter Solstice Illumination of Newgrange". Archived from the original on May 31, 2017. Retrieved November 2, 2017. ^ Hensey (2015). First Light: The origins of Newgrange. Oxbow Books. p. 13. ^ "Newgrange got new lease of light and life in 1960s 'rebuild'". Irish Times. 20 December 2008. ^Renfrew, Colin, in O'Kelly, Michael J. 1982. Newgrange: Archaeology, Art and Legend. London: Thames and Hudson. Page 7. ^ "Newgrange". newgrange.com. Retrieved 27 April 2015. ^ "Newgrange". Department of Arts, Heritage, Regional, Rural and Gaeltacht Affairs. Retrieved 28 July 2016. ^ Grant, Jim; Sam Gorin; Neil Fleming (2008). The archaeology coursebook. Taylor & Francis. p. 159. ISBN 978-0-415-46286-0. Retrieved 17 August 2011. ^ Benozzo, F. (2010). "Words as Archaeological Finds: A Further Example of the Ethno-Philological Contribute to the Study of European Megalithism". The European Archaeologist. 33: 7–10. ^ "British Museum - Collection search: You searched for". British Museum. Retrieved 27 April 2015. ^ "Brú na Bóinne (Newgrange, Knowth and Dowth)". Archived from the original on 12 October 2007. Retrieved 12 October 2007. ^Pitts (2006) Sensational new discoveries at Bryn Celli Ddu. British Archaeology No. 89 (July/August): 6. ^"An Important Mellifont Document." Journal of the County Louth Archaeological Society, vol. 14, no. 1, 1957, pp. 1–13. ^ Giot, P.-R. (1983). "Review: Newgrange: archaeology, art and legend". Antiquity. 57 (220): 150. ^"A History of Ancient Britain" Series 1 episode 3, "Age of Cosmology", BBC documentary, 2011. ^Alan Marshall, "Newgrange Excavation Report Critique"
Wikimedia Commons has media related to Newgrange. Newgrange is a Stone Age monument in the Boyne Valley, County Meath, Ireland. It was built about 3200 BC during the Neolithic period, which makes it older than Stonehenge and the Egyptian pyramids. Newgrange is a large circular mound with a stone passageway and chambers inside. The mound is ringed by 'kerbstones' engraved with artwork. Archaeologists classified Newgrange as a passage tomb, however Newgrange is now recognised to be much more than a passage tomb. Ancient Temple is a more fitting classification, a place of astrological, spiritual, religious and ceremonial importance. The passage and chamber is aligned with the rising sun on the winter solstice. It is the best know monument within the Brú na Bóinne complex, alongside the similar passage tomb mounds of Knowth and Dowth, and as such is a part of the Brú na Bóinne UNESCO World Heritage Site. Newgrange also shares many similarities with other passage tombs in Western Europe, such as Gavrinis in Brittany, Maeshowe in Orkney and Bryn Celli Ddu in Wales. After its initial use, Newgrange was sealed and it remained so until the passage and chamber were rediscovered in 1699. In the 1970s, the front of the monument was reconstructed. The Neolithic people who built the monument were farmers, growing crops and raising animals such as cattle in the area where their settlements were located; they had not yet developed metal, so all their tools would have been made out of stone, wood, antler or bone. The Newgrange monument primarily consists of a large mound, built of alternating layers of earth and stones, with grass growing on top and a reconstructed facade of white quartz stones studded at intervals with rounded cobbles covering part of the circumference. The mound is 76 metres (249 ft) across and 12 metres (39 ft) high, and covers 4,500 square metres (1 acre) of ground. Within the mound is a chambered passage, which can be accessed by an entrance on the south-eastern side of the monument. The passage stretches for 19 metres (60 ft), or about a third of the way into the centre of the structure. At the end of the passage are three small chambers off a larger central chamber, with a high corbelled vault roof. Each of the smaller chambers has a large flat "basin stone", which was where the bones of the dead were probably deposited. The walls of this passage are made up of large stone slabs, twenty-two of which are on the west side and twenty-one on the east, which average out at 1.5 metres in height; many are decorated with carvings. Situated around the perimeter of the mound is a circle of standing stones, which archaeologists regard as having been later, during the Bronze Age, centuries after the original monument had been abandoned as a tomb. 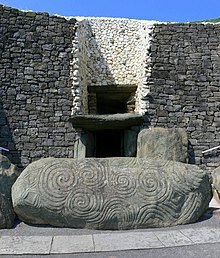 Newgrange contains various examples of Megalithic Art including circles, spirals, arcs, chevrons and lozenges, radials. One of the most notable examples of art at Newgrange is the triskele-like features found on the entrance stone. It is about 3 metres (10 ft) long and 1.2 metres (4 ft) high and about 5 tonnes in weight. It has been described as "one of the most famous stones in the entire repertory of megalithic art." Archaeologists believe that most of the carvings were produced prior to the stones being erected in place, although the entrance stone was instead carved in situ before the kerbstones were placed alongside it. Various archaeologists have speculated as to the meaning of the decoration, George Coffey (who produced a study of art at "New Grange" in the 1890s), believed them to be purely decorative, whilst others, like Michael J. O'Kelly (who led the 1962–1975 excavation at the site), believed them to have some sort of symbolic purpose, because some of the carvings had been in places that would not have been visible, such as at the bottom of the orthostatic slabs below ground level. An extensive research on how the art relates to alignments and astronomy in the Boyne Valley complex was carried out by American-Irish researcher Martin Brennan. The complex of Newgrange was originally built about 3200BC, making it over 5,000 years old. According to carbon-14 dates it is about five hundred years older than the current form of Stonehenge, and the Great Pyramid of Giza in Egypt, as well as predating the Mycenaean culture of ancient Greece. Geological analysis indicates that much of building materials used to construct Newgrange was greywacke stone from the rocky beach at Clogherhead, Co Louth, approx. 20 km to the north-east. The greywacke stone blocks were possibly transported to the Newgrange site by sea and up the River Boyne by securing them to the underside of boats at low tide. None of the structural slabs were quarried, for they show signs of having been naturally weathered, but they must have been collected and then transported somehow largely uphill to the Newgrange site. Meanwhile, the stones used for the cairn, which together would have weighed around 200,000 tonnes, were likely taken from the river terraces between Newgrange and the Boyne, and there is indeed a large pond in this area which has been speculated was the site quarried out by Newgrange’s builders to use for material for the cairn. Professor Frank Mitchell suggested that the monument could have been built within a space of five years, basing his estimation upon the likely number of local inhabitants during the Neolithic and the amount of time they would have devoted to building it rather than farming. This estimate was however criticised by Michael J. O’Kelly and his archaeological team, who believed that it would have taken a minimum of thirty years to build. Excavations have revealed deposits of both burnt and unburnt human bone in the passage, indicating human corpses were indeed placed within it, some of which had been cremated. From examining the unburnt bone, it was shown to come from at least two separate individuals, but much of their skeletons were missing, and what was left had been scattered about the passage. Various grave goods were deposited alongside the bodies inside the passage. Excavations that took place in the late 1960s and early 1970s revealed seven 'marbles', four pendants, two beads, a used flint flake, a bone chisel and fragments of bone pins and points. Many more artefacts were found in the passage in previous centuries by visiting antiquarians and tourists, although most of these were removed and missing or were held in private collections. Nonetheless, these were sometimes recorded, and it is believed that the grave goods that came from Newgrange were typical of Neolithic Irish passage grave assemblages. There have been various debates as to its original purpose. Many archaeologists believed that the monument had religious significance of some sort or another, either as a place of worship for a "cult of the dead" or for an astronomically-based faith. The archaeologist Michael J. O'Kelly, who led the 1962–1975 excavations at the site, believed that the monument had to be seen in relation to the nearby Knowth and Dowth, and that the building of Newgrange "cannot be regarded as other than the expression of some kind of powerful force or motivation, brought to the extremes of aggrandizement in these three monuments, the cathedrals of the megalithic religion." O'Kelly believed that Newgrange, alongside the hundreds of other passage tombs built in Ireland during the Neolithic, showed evidence for a religion which venerated the dead as one of its core principles. He believed that this "cult of the dead" was just one particular form of European Neolithic religion, and that other megalithic monuments displayed evidence for different religious beliefs which were solar, rather than death-orientated. However studies in other fields of expertise offer alternative interpretations of the possible functions, which principally centre on the astronomy, engineering, geometry and mythology associated with the Boyne monuments. It is speculated that the sun formed an important part of the religious beliefs of the neolithic ("New" Stone Age) people who built it. One idea was that the room was designed for a ritualistic capturing of the sun on the shortest day of the year, the Winter Solstice, as the room gets flooded with sunlight, which might have helped the days start to get longer again. This view is strengthened by the discovery of alignments in Knowth, Dowth and the Loughcrew Cairns leading to the interpretation of these monuments as calendrical or astronomical devices. Formerly the Newgrange mound was encircled by an outer ring of immense standing stones, of which twelve of a possible thirty-seven remain. However, evidence from carbon dating suggests that the stone circle which encircled Newgrange may not be contemporary with the monument itself but was placed there some 1,000 years later in the Bronze Age. This view is disputed and relates to a carbon date from a standing stone setting which intersects with a later timber post circle, the theory being that the stone in question could have been moved and re-set in its original position at a later date. This does however show a continuity of use of Newgrange of over a thousand years; with partial remains found from only five individuals, the tomb theory is called into question. On the mornings around the winter solstice, the rising sun shines directly along the long passage into the chamber for about 17 minutes and illuminates the chamber floor. Professor Michael J. O'Kelly was the first person in modern times to observe this event on 21st December 1967. The sun enters the passage through a specially contrived opening, known as a roofbox, directly above the main entrance. Although solar alignments are not uncommon among passage graves, Newgrange is one of few to contain the additional roofbox feature. In 2015 on the night of December 20th the Aurora Borealis (Northern Lights) were clearly visible over Newgrange. Current-day visitors to Newgrange are treated to a re-enactment of this event through the use of electric lights situated within the tomb. The finale of a Newgrange tour results in every tour member standing inside the tomb where the tour guide then turns off the lights, and lights the light bulb simulating the sun as it would appear on the winter solstice. Anyone visiting the historic site can experience an approximation of the phenomenon any time of year, and is often the highlight of the tour. A lottery is held annually for "tickets" to allow the holder into the tomb to view the actual event. The popularity of this event was the reason a lottery was introduced, and also why the lights were installed. During the medieval period, Newgrange and the wider Brú na Bóinne Neolithic complex, gained various attributes in local folklore, which was often connected to figures from wider Irish mythology. The monuments of the Brú were thought of by some as being the abode of the supernatural Tuatha De Danann, whilst others considered them to be the burial mounds of the ancient kings of Tara. Amongst those who believed the folkloric tales relating the Brú to the Tuatha De Danann, it was commonly thought that they were the abode of the most powerful of the Tuatha, particularly The Dagda, his wife Boann and his son, Oengus. According to the 11th century Book of Lecan, the Dagda had built the Brú for himself and his three sons, whilst the 12th century Book of Leinster describes how Oengus tricked his father into giving him the Brú for all eternity. Another text, The Pursuit of Diarmaid and Grainne also implies that Oengus owned the Brú, when he declared how he took his friend Diarmaid to it. In the 12th century mound and the land around it become part of outlying farmland owned by the Cistercian Abbey of Mellifont. These farms were referred to as 'granges'. By 1378 it was simply called 'the new grange'. In 1699, a local landowner, Charles Campbell, ordered some of his farm labourers to dig up a part of Newgrange, which then had the appearance of a large mound of earth, so that he could collect stone from within it. The labourers soon discovered the entrance to the tomb within the mound, and a Welsh antiquarian named Edward Lhwyd, who was staying in the area, was alerted and took an interest in the monument. He wrote an account of the mound and its tomb, describing what he saw as its "barbarous sculpture" and noting that animal bones, beads and pieces of glass had been found inside of it. Soon another antiquarian visitor also came to the site, named Sir Thomas Molyneaux, who was a professor at the University of Dublin. He talked to Charles Campbell, who informed him that he had found the remains of two human corpses in the tomb, something that Lhwyd had not noted. Subsequently, Newgrange was visited by a number of antiquarians, who often performed their own measurements of the site and made their own observations, which were often published in various antiquarian journals; these included such figures as Sir William Wilde, Sir Thomas Pownall, Thomas Wright, John O'Donovan, George Petrie and James Ferguson. In the 19th century a folly was constructed a few yards behind Newgrange. The folly, with two circular windows, was made of stones taken from Newgrange monument. In 1882, under the Ancient Monuments Protection Act, Newgrange, along with the nearby monuments of Knowth and Dowth, was taken under the control of the state (United Kingdom of Great Britain and Ireland, as it was then known), and they were placed under the responsibility of the Board of Public Works. In 1890, under the leadership of Thomas Newenham Deane, the Board began a project of conservation of the monument, which had been damaged through general deterioration over the previous three millennia as well as the increasing vandalism caused by visitors, some of whom had inscribed their names on the stones. In subsequent decades, a number of archaeologists performed excavations at the site, discovering more about its function and how it had been constructed; however, even at the time, it was still widely believed by archaeologists to be Bronze Age in origin rather than the older Neolithic. In the 1950s, electric lighting was installed in the passageway to allow visitors to see more clearly, whilst an exhaustive archaeological excavation was undertaken from 1962 through to 1975, the excavation report of which was written by Michael J. O'Kelly and published in 1982 as Newgrange: Archaeology, Art and Legend. Following this excavation, further restoration took place at the site. As a part of the restoration process the white quartz stones and cobbles were fixed into a near-vertical concrete wall surrounding the entrance of the mound. This restoration is controversial among the archaeological community. Critics of the wall point out that the technology did not exist when the mound was created to fix a retaining wall at this angle. Another theory is that the white quartz stones formed a plaza on the ground at the entrance. Access to Newgrange is by guided tour only. Tours begin at the Brú na Bóinne Visitor Centre from which visitors are bussed to the site in groups of up to 24 per shuttle bus. To experience the phenomenon on the morning of the Winter Solstice from inside Newgrange, one must enter a lottery at the interpretive centre. At the end of September each year, 50 names are drawn by local school children, 10 names for each morning the chamber is illuminated, 2 places in the chamber are awarded to each of the lottery winners. A reserve list is also drawn, the reserve list is there in case someone whose name is drawn for the initial list is not contactable or else finds it impossible to travel to Newgrange on the date they have been assigned. Places allocated by lottery are non-transferable. Lottery winners cannot offer their place in the chamber to someone else.